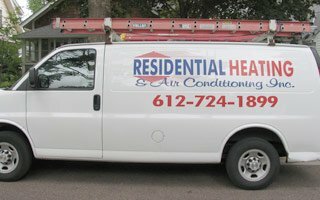 Residential Heating and Air Conditioning was founded in 1991 with the goal of providing the very best in home heating and cooling sales and service to the entire Twin Cities Metro Area. From our headquarters in Minneapolis, we serve the entire seven-county region. Over the years since we started our business, we have worked hard to build an outstanding reputation by providing high-quality, professional service in this highly competitive business. Our dedication to excellence has led us to achieve a solid A+ rating from the Better Business Bureau. We have also earned many awards from consumer ratings organizations including Angie’s List. Today, we maintain that dedication to integrity, excellent products, exemplary service in everything we do, from sales and service of Carrier, Lennox, Goodman and Payne equipment to our highly trained maintenance and repair team. Integrity – In everything we do, we provide accurate information, fair dealing, affordable price, honesty and efficient service. Each customer gets our very best. Integrity is our hallmark. Customer Protection – As a leading HVAC contractor, we are fully licensed and bonded and carry full liability and workman’s compensation insurance. 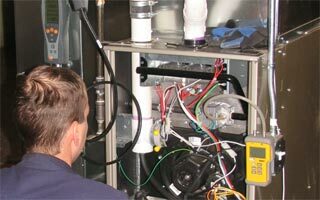 Professionalism – Our management and staff have the credentials and extensive training that assure our customers of complete and proper service for sales, installation, and maintenance of their heating and cooling systems. Promptness and Courtesy – From our sales staff to our factory-trained and certified technicians, we strive to arrive on schedule, ready to provide the services you need. We’ll be there quickly, on time, and won’t keep you waiting. We treat every customer with the same respect we show our own families. Quality Products – For our valued customers, we have selected only proven, time-tested heating and air conditioning products. Trusted brands like Carrier, Lennox, Payne, Goodman, LG, Tempstar and others assure our customers of long life and affordable cost. Professional Training – At our heating and air conditioning company, training for our technicians and sales staff never stops. Changes in product offerings and HVAC technology occur constantly, and we work tirelessly to stay on top of every change. Accurate Price Quotes – For every sale or service estimate, we provide accurate, complete price quotes, with no hidden costs. If conditions require changes in our services, we discuss those changes clearly with customers before proceeding. Competitive Pricing – We encourage our customers to compare prices, because we are confident that our pricing competes with anyone for the same products and services. We pass along all savings from our high volume purchasing and help customers understand and benefit from all available rebates and credits. Education for Customers – Through our more than two decades of service, we understand that we serve our customers best by helping them understand all of their choices so they can make the best decisions for their unique needs. We never engage in high-pressure sales tactics. Instead, we inform customers of all options and let them make their own informed decisions. Outstanding Customer Service – Completely satisfied customers are our most important assets. We strive in everything we do to provide outstanding customer service. Until you are satisfied, our job is not done. Serving the Entire Metro – We have over 35,000 satisfied customers across the Twin Cities, from Edina, Blaine, Lakeville and Eagan to Eden Prairie, St. Louis Park, Minnetonka and Wayzata, and from Roseville, New Brighton, Richfield and Cottage Grove to Bloomington, Mendota Heights, Apple Valley and Arden Hills. Like every other company, maintaining a solid reputation for excellence is essential for our business success and longevity. As an award-winning heating and air conditioning contractor in the Minneapolis St. Paul area, we’ve seen competitors come and go since our founding in 1991. By meeting and exceeding our customers’ expectations, we have over 35,000 satisfied customers to demonstrate our success. We hope you’ll explore our website and learn more about our top-quality services and reputation. We look forward to your call and to serving you with any heating and air conditioning need.